Welcome to the first Minnesota Minute of 2019! Most of the teams in the Land of 10,000 Lakes didn’t do too much, but there a few tidbits and stats that you will surely want to see! Results and News: The Vikings are on the hunt for a new offensive coordinator, as it appears that interim OC Kevin Stefanski will not be back in 2019 (his contract expired at the conclusion of the season). Mike Mularkey and Hue Jackson have been names that have been mentioned, though the steam on Jackson has cooled recently. Stat of the Week: In six seasons as a head coach, Mularkey’s teams were below average on offense in four of the six years. He was coaching for the Bills and Titans in those two stints though, and he may have better luck just as an offensive coordinator. Results and News: Head coach and president of basketball operations Tom Thibodeau was fired after Sunday’s game against the Lakers, which the Timberwolves won 108-86. Ryan Saunders, son of the former late Wolves coach Flip Saunders, will take over as the interim head coach. Assistant coach Andy Greeder was also let go with Thibodeau, while Scott Layden remains the GM. Fred Hoiberg has been mentioned as a possible replacement candidate. The Timberwolves went 2-2 this week, losing to the Pelicans (114-123) and Celtics (102-115) on the road before picking up wins over the Magic (120-103) and the Lakers. Karl-Anthony Towns has been unstoppable lately, averaging 28.3 points per game in his last six contests. The Wolves will go to Oklahoma City on Tuesday before returning home for matchups against Dallas (Friday) and New Orleans (Saturday). Stat of the Week: 27th, 25th, and 17th. Those were the three rankings for the Timberwolves in defensive rating over Thibs’ three seasons as POBO and head coach. Though the defense has improved this season, Thibodeau’s reputation as a great defensive coach was debunked in his time in Minnesota. Results and News: After signing Nelson Cruz, the Twins have been fairly quiet. There are still some quality pitchers left in the bullpen market, and it seems likely that the Twins will sign at least one or two before spring training begins in February. Stat of the Week: The Twins bullpen ranked last in the MLB with 89 home runs allowed last season. That unit also ranked 22nd in ERA with a 4.45 mark. Results and News: The Wild fell 3-2 to the Penguins before bouncing back with a 4-3 comeback win against the Maple Leafs and another 4-3 comeback victory against the Senators. Jared Spurgeon netted three goals for Minnesota in the two wins. The Wild will play at Montreal (Mon. ), at Boston (Tues.), home against Winnipeg (Thurs. ), and home against Detroit (Sat.) next week. Stat of the Week: The Wild penalty kill has been top-notch this season, ranking third in the league with a percentage of 84.7. Results and News: In their lone matchup of the week, the Golden Gophers upset the #22 Wisconsin Badgers in the Kohl Center. Leading the charge was Amir Coffey, who ended his day with 21 points. At one point the junior scored 15 straight points for maroon and gold. 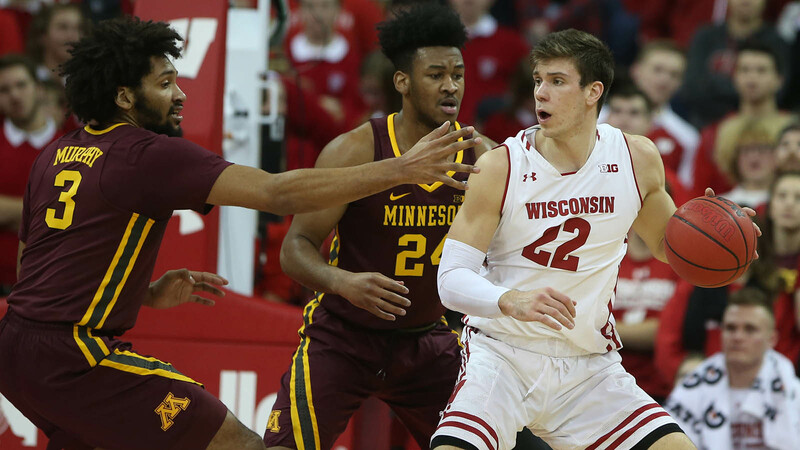 A major reason for the Big Ten win was for their defensive play, as they held the Badgers to 52 points and 22.7% from three point land. The rival from the east also shot an astonishingly horrendous 41.2% from the free throw line. Their next matchup will be Tuesday against the Maryland Terrapins at Williams Arena. Stat of the Week: The win ended an eight game losing skid in the Kohl Center for the Gophers, their first win in Madison since 2009. Although he didn’t have a major impact on the game against Wisconsin, Daniel Oturu is averaging 1.9 blocks per game (3rd in the Big Ten). The last Gopher to lead the conference in blocks was Reggie Lynch during the 2016-2017 season. Results and News: The Gopher women were upset twice this week. After entering the week as the 12th team in the country with a 12-0 record, coach Lindsay Whalen and her team stumbled up as they lost two conference matchups against Illinois (62-66) and Michigan (60-76). They will have to pick themselves up and get ready for a matchup against highly ranked Michigan State in East Lansing, Michigan. Stat of the Week: In their loss against Michigan, the Gophers only shot four three point shots, making only one in the process. That is a sharp decline from their average mark of 12 attempts per game. If they want to get back to their winning ways, effectively shooting the deep ball will have to be a part of that process. Results and News: It has been a quiet week for the Golden Gophers football program as players are off and coaches are in the midst of a dead period for recruiting. Early enrollees in the 2019 recruiting class will enroll at the University of Minnesota within the next week or so. Action should ramp up next week as coaches are once again out on the recruiting trail looking to wrap up an already high quality recruiting class. Stat of the Week: There will be twelve current commits in the 2019 class that will be early enrollees and enrolling in classes this month. Those twelve are highlighted by 4* Rashad Cheney and Jacob Clark.